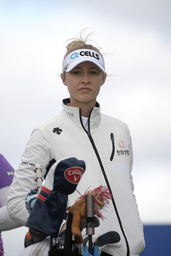 PHOENIX (AP) David Whelan has tried to teach Nelly Korda that she doesn't need to be perfect to win on the LPGA Tour. "My coach constantly tells me that," Korda said at the Founders Cup. "I want to practice perfectly. I want to play perfectly all the time. He thinks I'm such a perfectionist. That's one thing we always kind of like argue about. I'm starting to kind of get the grasp of like you can't be perfect all the time." The 20-year-old Korda will open play Thursday at Desert Ridge in the event that honors the 13 women who founded the LPGA Tour in 1950. "It's really special to us to see how far this tour has come," she said. Korda won the Women's Australian Open last month for her second LPGA Tour victory and leads the money list. She's coming off a 10th-place finish three weeks ago in Singapore, her fourth straight top-10 to open the year. After winning in Australia, she played through a nagging cold in Thailand and Singapore. "Not 100 percent, but very close," she said. "I'm almost over it. Still have a little cough." The victory added to her family's sports pedigree Down Under. Her father, Petr Korda, won his lone Grand Slam tennis title in the 1998 Australian Open. Older sister Jessica Korda won the Women's Australian Open seven years ago for the first of her five LPGA Tour titles, and brother Sebastian took the Australian Open boys' singles title last year. Inbee Park is the defending champion in the low-scoring desert event. "Got to make a lot of birdies out here," Park said. The tournament is played on a combination of Wildfire Golf Club's two courses, with the back nine of the Arnold Palmer-designed layout serving as the front nine and the Nick Faldo-designed course's final nine as the back nine. "It's really flawless," Park said. "This golf course is definitely scorable and everybody scores really well." Winless since the event last year, the 19-time tour champion opened the season three weeks ago in Singapore with a 14th-place finish. "I feel a little bit still fresh, but I am looking forward to playing the stretch starting in this event and on," Park said. "I'm trying to play a little bit more if my body allows it to. I have scheduled probably three to five more events this year than last year." Seven of the top 10 players in the world are in the field. Top-ranked Sung Hyun Park, the Singapore winner, is playing along with No. 2 Ariya Jutanugarn, No. 3 Minjee Lee, No. 6 Park, No. 8 Korda, No. 9 Jin Young Ko and No. 10 Brooke Henderson. Brittany Lincicome is expecting her first child, a daughter, in early September. She said Tuesday that sponsors CME Group and Diamond Resorts have committed to honor their contracts throughout the pregnancy, not a common practice for LPGA Tour players. "I never thought in a million years that they would do that," Lincicome said. "I feel so honored and blessed to be represented by two great companies." The eight-time tour winner is making her second start of the season. The LPGA Tour unveiled a branding initiative Wednesday called Drive On. "Drive On is clearly rooted in golf, but it's a bigger idea," the tour said. "It captures the power and potential in each of us and celebrates the hard work, focus, and tenacity that it takes to achieve our goals." The tour launched the program with a 45-second video on social media.